In 2013, husband and wife team, Matt and Tanya purchased two tired frame stores, one in Westmount and the other in Dorval, with the goal of revitalizing them into a modern framing company, Le Frame Shoppe. ​Matt, with years of experience in design and custom framing and Tanya, a former Director of Operations, decided that hand in hand their dreams to own their own business could become a reality. Plans scribbled on the back of napkins, long conversations over morning coffees and lots of determination and hard work has turned into a quickly growing custom picture frame company that services residential and commercial clients. After such an overwhelmingly positive response, Matt and Tanya were able to grow the business even further and in November 2017, opened a third Le Frame Shoppe in Beaconsfield. Their love for the craft and their appreciation for the opportunities you’ve given them can be seen in everything Le Frame Shoppe. Matt and Tanya are living out their dream and thank you for being a part of it! 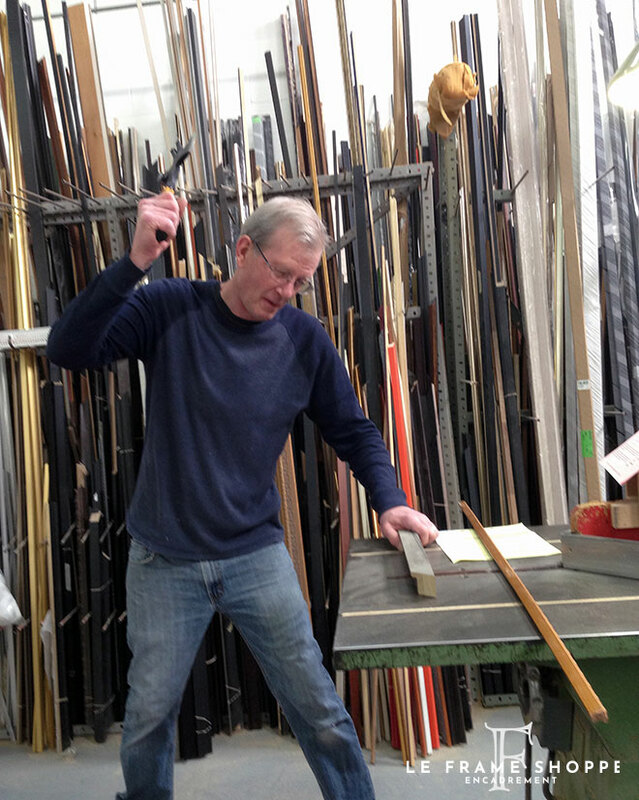 With a constant push for fresh ideas and an all-star team of experienced custom framers and artisans, Le Frame Shoppe works hard for its customers. It is the everyday goal to create an inspiring and fun frame design experience while providing amazing customer service and producing outstanding frames. We have 3 convenient locations, our flagship store and workshop in Dorval and our framing boutiques in Westmount and Beaconsfield. Come in and experience your next custom framing with Le Frame Shoppe! We strive to be the best in our field by focusing on our clients’ needs and offering innovative custom framing designs. Our experienced and friendly team works with you, for you, to create a one-of-a-kind piece that matches your budget, your style and delivers your ‘wow’ moment. After all life is better framed and we want to show you why! Our business has become a place where clients from retail to commercial can expect creativity, trustworthiness and resolve when they use our services. And we couldn’t be more proud!